Ce charmant 4e rang Ocean Accueil fait appel à Sea Pines plage amateurs de tous les âges. La grande salle dispose de parquet et confortable, aménagement confortable et la grande véranda offre brises de détente en soirée et donne sur votre piscine privée & Spa. Avec 2 lits King, Queen et Queen + Twin. Cette maison est idéale pour les couples et les familles qui aiment la plage et tous les équipements merveilleux trouvés dans le Sea Pines Resort. Wifi gratuit. Véranda, piscine privée et facile à pied de la plage! Nice location, pool and house. Beach is a short walk. Unfortunately, I would not recommend due to issues spanning 2 days with the security/alarm system that shouldn't have taken so long to fix. The mattresses are very nice, but the sheets are not large enough and come off easily while sleeping; pillows need to be replaced. The house could use some dusting and a 4 slice toaster would be a nice upgrade. Kitchen cabinets are disorganized so it makes it difficult to know what's available or find anything. Good location. Needs a garbage disposal in the kitchen. 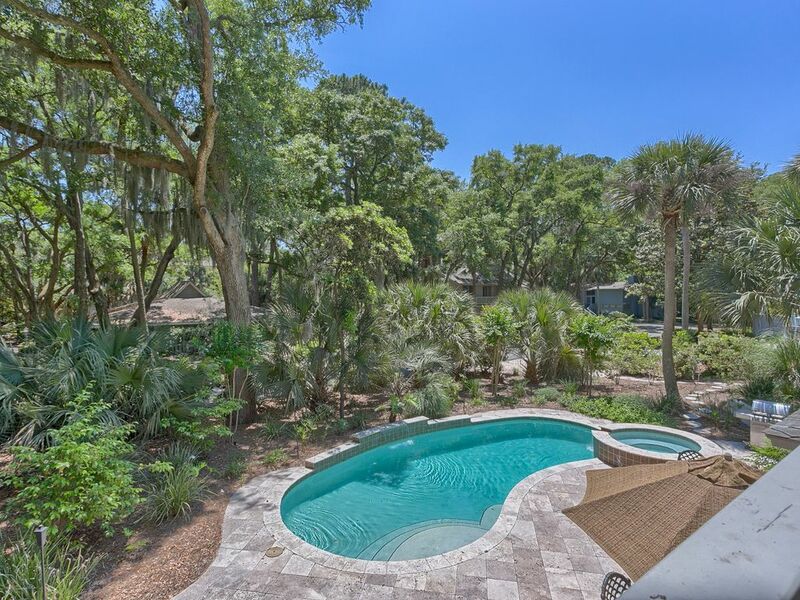 Large home easily accommodating 8 adults, easy walking distance to beach and great location in Sea Pines close to Hilton Head. Recommend bike rental to take advantage of the terrific bike paths. One issue was lower level bedrooms had musty smell and moths. Property management company did respond to spray but moths were present all week. Fees for heating pool and hot tub exhoberent. We rented this home in August 2018, and overall we had a good experience. Everything worked, and we had everything we needed. Our only complaints were the overall layout of the home, which we understand isn't anyone's fault. IT just didn't work well with 2 young children. Additionally, cleanliness of the home was not that great either. The home needs some renovation, and we found lots of bugs and roaches. The best part of this home was the screened in porch. The furnishings are pretty good overall as well. We travelled with our 2 young children, and grandparents, and so the pool access was not the best either. There was no locked gate to protect children from getting we had to keep a real close eye on them as well. We stayed at 12 Surf Scoter on our most recent visit to Hilton Head. We always choose a house in Sea Pines that is near the beach. We have 3 families (total of 10 with 4 kids) so we enjoy being in Sea Pines, having a pool at the house and proximity to the beach. This is a 4 br, so we put all the kids in one room. This house worked very well for us. The pool area was especially nice with waterfalls in the pool and a spa attached. We had the pool heated to be safe and it was comfortable all week. The screened in porch was also a great hit. We spent most of our time there when at the house and the furniture was very nice and there was plenty of room for everyone. No complaints about the house. It seemed to be well taken care of. We did have a problem with the ice maker and had to buy ice for the week ,but the rental company reimbursed us for that. We did have to walk down the street to get to the beach path (we're used to being a bit closer), but from there it was a short walk to the beach. Location is good for biking, except you do have to cross the main road when coming out to get on the bike trail across the street. Nice rides to Salty Dog, Harbour Town, Lawton Stables from here. All in all we were pleased with 12 Surf Scoter. Loved this house, 4 couples each with our own bedroom and bathroom, walking distance to beach, perfect weather, grocery store very close, and shopping, pool and hot tub what more do you need? Home was clean and well kept. Could use instructions for hot tub, and air conditioning.